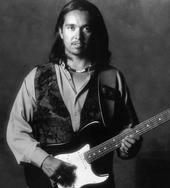 My good friend Sir Harrison turned me on to Todd Tijerina (Tee-her-ee-na) from Albuquerque, New Mexico; a fellow Strat brother and serious bluesman! After immersing himself in the Chicago Blues scene for 3 years of "undergraduate work", Todd headed back to the Southwest, an area which he heavily tours-- including the Rocky Mountain states, plus occasional trips back to Chicago. That's plenty of area for sure, but I know they'd love him in Europe and Asia as well. Todd fronts a small Double Trouble tight trio (try saying that 5 times fast) and serves up righteous Strat tones, along with occasional Albert Collins wicked vibrato that sounds more buttery on a Strat than a Tele. Remember, too much Tele can be toxic. Also handling the vocal duties, Todd's voice reminds me of a very young Curtis Salgado. If you happen to be venturing into the Southwest and New Mexico for bidness or pleasure, also check out The Platero's and Sir Harrison and the Blues Kings.